Matrix population models and integral projection models are among the most widely used tools to model the dynamics of plants and wildlife populations. They play a central role in ecology, evolution and conservation biology. 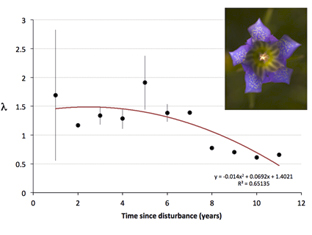 For instance, the graph on the right shows the relationship between lambda (population growth rate, calculated from projection matrices), and the time since disturbance of the vegetation in the habitat of Gentiana pneumonanthe (Marsh gentian) began. The Integral Projection Model (IPM) workflow provides an environment to create and test the IPM, and allows users to perform several analyses on that. IPMs are related to classic matrix models (see MPM workflow above) but IPMs are more appropriate for modelling structured populations when the variable describing an individuals’ demography is continuous (e.g., size, weight, etc.). The Matrix Population Model (MPM) collection comprises 24 workflows that provide an environment for creating a stage-matrix with no density dependence (see under Web services). They allow users to perform several analyses on a matrix or a series of matrices. The workflows can be executed on the BioVeL portal under https://portal.biovel.eu/workflows?category_id=5&filtered=true&page=all. Each workflow requires specific input data. Click on the links below to learn more about each workflow. Bootstrap of observed census transitions. Salguero-Gomez et al. (2015). The COMPADRE Plant Matrix Database: an open online repository for plant demography. Journal of Ecology 103; 202-218, doi: 10.1111/1365-2745.12334.